So have you had a hard time finding a brand of Teriyaki sauce that you like at the store? Or even more likely, have you ever found yourself quickly approaching dinnertime and you think you have nothing to make? Well, I’m here to tell you that I’m willing to bet that you always have the ingredients to make Teriyaki something on hand. I almost always have the ingredients for Teriyaki sauce in my cupboards and I almost always have chicken breasts or thighs, steak, a pork tenderloin, or salmon in my freezer. So, at least in my world, if I don’t have all of those things on hand, something is seriously wrong in my universe. What makes this even better is that you can literally make this for pennies and, not trying to be Braggy Braggerson here, but I think it’s better than anything you can buy at the store. I also like that it’s a little thick, so it works well as a glaze or dipping sauce. I really love it on chicken thighs. You don’t even have to marinate the chicken first (although marinating is certainly never a bad thing). Just heat up your grill and baste every 10 minutes or so until they’re done, or you can do it in an oven heated to 425. Just line a baking sheet with foil and bake for about 40 minutes, basting regularly and turning the chicken halfway through. You’re going to need some cornstarch, cold water, white sugar, soy sauce, apple cider vinegar (I ALWAYS use Bragg’s or other organic apple cider vinegar with the Mother), garlic, ginger (freshly grated or powdered), and black pepper. 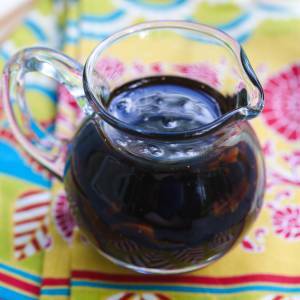 In a medium saucepan, combine sugar, soy sauce, vinegar, garlic, ginger, and black pepper. You can use either ground ginger as directed or about 1 1/2 teaspoons of fresh ginger. Combine your ingredients in the saucepan and bring to a boil over medium-high heat. While sauce is heating, combine cornstarch and cold water. When sauce comes to a full boil, add cornstarch mixture and stir until sauce is thickened and bubbly. Remove from heat and use any way you darn well please. You can store it in the fridge in an air-tight container for up to 2 weeks. 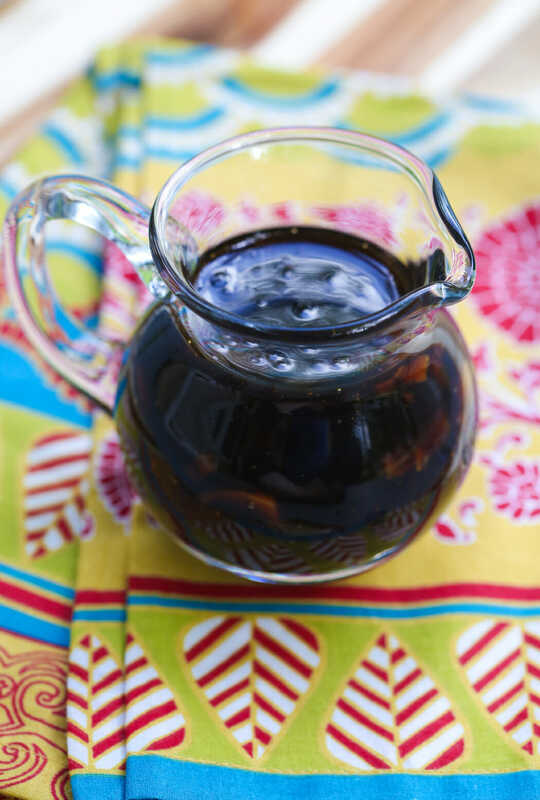 This quick and easy teriyaki sauce recipe and glaze uses a handful of pantry ingredients to make THE BEST Teriyaki you’ve ever had! In a medium saucepan, combine sugar, soy sauce, vinegar, garlic, ginger, and black pepper. You can use either ground ginger as directed or about 1 1/4 tsp. of fresh ginger. Combine your ingredients in the saucepan and bring to a boil over medium-high heat. While sauce is heating, combine cornstarch and cold water. When sauce comes to a full boil, add cornstarch mixture and stir until sauce is thickened and bubbly. Remove from heat and use any way you darn well please. You can store it in the fridge in an air-tight container for up to 2 weeks. I’ve been using this exact recipe for years. It’s my favorite!! I made this once to use with Kate’s recipe for teryaki bacon wrapped chicken skewers (which I’m SURE she’ll share with us one of these days, they’re delish) and I thought it was really great. I used fresh ginger in mine and I loved the flavor. You’re blog is the best! Simply put it inspires my style of cooking, thanks for doing such a great job! I agree-your website is wonderful! Try adding a little Saki wine to your sauce and you’ll be pleasantly surprised! Kate, next time I see you I’m going to give you a big fat kiss! I did have all these ingredients on hand, and it was so easy to make! It is REALLY rare that what I attempt to cook actually turns out, and even rarer if it takes good – and this hit it out of the park! Shane and I are SO grateful for you posting this recipe. It was absolutely divine. Next time I’m at the store, I’m stocking up on soy sauce! I made a double batch of this last night and it is so good! I baked a chicken breast in the oven and marinated it with this sauce and then stirfried it with a bunch of veggies and put it over rice. YUM! This was great – my family loved it (and that included a very picky 4 year old boy!) I will never buy teriyaki sauce again. Thanks for another great recipe! I love teriyaki sauce and I recently found out that I have celiac disease…. which means that I can't have store-bought teriyaki sauce. Thank you for providing me with a recipe that I can use (with GF soy sauce substitute) to make gluten-free with a flavor that I LOVE. You're recipes are the BEST!! You are amazing!!!! I am so excited to be able to make a gluten free teriyaki for my family. This will come in extremely handy for so many different things thanks so much. wonderful. I have never tasted anything that comes close to being this good. At the end of cooking mine I added some Weber Chicago seasoning and it kicked up the spice which is how I like it. 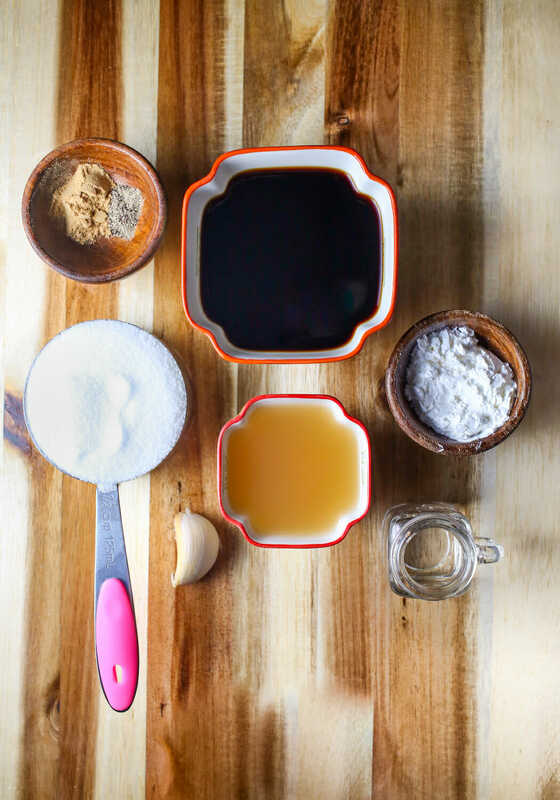 My FAVORITE recipe using ALOHA SOY SAUCE requires 4 simple ingredients and 3 hours to deliciousness.. Equal parts Aloha Soy Sauce, Water, and Sugar. Bring those ingredients to a boil and add however many frozen, (yes, I said frozen) boneless skinless chicken thighs to the pot, WATCH CLOSELY as you bring it back up to a boil, once it boils, turn it down to a simmer, cover, and cook for 3 hours. Serve over rice. my emsil is brendasue2003@gmail.com if you have any questions. Feel free to post it to your blog. So I just discovered your page today and CANNOT wait to try lots of your recipes! This sounds to good and easy to be try. Love being able to control the sodium and cost co,pared to store bought teriyaki sauce! Seems yummy for kabobs and am gonna use it later this week for your Hawaiian turkey burgers! Thanks for sharing! Hi Kate and Sara! I enjoy perusing your website. Thank you for all the wonderful recipes. I just wondered–how long will this recipe keep? I am just looking for a fun recipe for a bunch of 8-9 year old girls to make for an activity on June 14 to give for Father’s Day . . . will this still be good for Father’s Day on June 19? Do you have any other ideas/recipes from your site that I could use for this activity. I was also looking at Sara’s marinade for fajitas, but had the same question . . . how long will that marinade keep? Maybe I should stick with just a cookie mix in a jar and call it good. THANK YOU! You are both amazing! It would probably still be good, but it would need to be refrigerated. If you’re wanting this type of thing, our chili spice mix would be a good one! This sauce is converted to gluten-free by simply choosing gluten free soy sauce like La Choy. Oh my deliciousness! Just had it with some chicken breasts and I CANNOT tell you how in love with it I am! Thank you! I used liquid aminos (I have a wheat allergy) the sauce was fabulous!! If I use frozen chicken tenders, would this work in the oven? If so, how long would I cook them do you think? Should I marinate them first in the sauce? Thank you. I just love this blog!!! Your blog is the ultimate cooking blog! Thank you very much for all your tips and delicious recipes, even an amateur like me can make them work. Keep it up! This is a serious success!!! I just made this sauce and pork/beef skewers. They were a HIT! thank you very much for sharing!! I’ve made the teriyaki sauce at least 3times already, everyone loves it. I’ve tried it with beef and chicken and the sauce is amazing. It tastes way better than from the bottle. Thanks so, much for making my parties a success. Wonderful recipe! I tried it for tonight’s dinner and my husband couldn’t resist a second serving of my chicken teriyaki bowl! Thanks for sharing!! Sorry Yuna, we won’t be much help. We don’t drink alcohol so we’ve never added either of those things! Made this again last night. You are FABULOUS! My favorite teriyaki is Yoshidas, but I can’t find it in Arkansas! So I turned to your blog and I really love this teriyaki too. I also discovered that by adding 1/4 t of curry powder it taste almost exactly like my favorite sauce. Thanks for the great recipe! I made this last night and it was so good! I poured it over some rice, vegetables, and chicken. I love that this sauce can be made so quickly for an easy and healthy dinner. I used swerve instead sugar. Turned out great!. This will be my go to sauce f from now on! YES! That makes us happy to hear! !